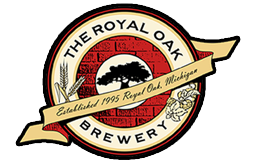 The Royal Oak Brewery | Serving Royal Oak, MI Since 1995! Poblano, Hungarian and roasted red peppers with Andouille sausage, Manchego cheese, potatoes, onions and garlic. Topped with melted mixed cheeses and served with tortilla chips. Fresh peppers tempura battered and flash fried. Drizzled with a spicy Asian sauce. Chicken wings with your choice of sauce. BBQ, Hot Wing or Mango Habanero. Housemade rolls of potato, jalapeno, caramelized onion, garlic and Manchego cheese coated in panko breadcrumbs and fried. Served with a tangy honey dipping sauce. Housemade dough with fresh basil, red pepper flakes, garlic butter and mozzarella cheese. Spicy chicken, peppers, onions, shiitake mushrooms and mixed cheese. Served with sour cream and salsa. Soft pretzel sticks baked and tossed in butter and salt. Served with Asiago cheese and whole grain mustard. Combination of our black bean and Asiago cheese dips. Served with housemade tortilla chips. A creamy Muenster cheese soup made with Royal Oak Red Ale. Mixed peppers, corn, tomatoes and spices blended with pulled chicken breast. Garnished with flour tortilla strips. Creamy tomato and basil soup with a savory finish. Breaded chicken breast, chopped iceberg lettuce, shredded mixed cheeses, tomatoes, corn and onions tossed in a housemade Buffalo Ranch dressing. Sliced Black Forest ham, smoked turkey and Swiss cheese and iceberg lettuce chopped and tossed in our homemade Maurice dressing with eggs, cherry peppers, green olives and sweet gherkin pickles. Green leaf lettuce, corn, black beans, diced tomatoes, red onions, avocado, tortilla strips, grilled chicken and mozzarella cheese tossed in a cilantro lime dressing. Spring mix, caramelized walnuts, dried Michigan cherries, granny smith apples, crème fraiche and tomatoes. Served with balsamic vinaigrette. Mixed greens, tomato, cucumber, cheese and croutons. Your choice of ranch, blue cheese or Balsamic vinaigrette. Pizza sauce, mozzarella cheese and lots of pepperoni. Artichoke hearts, mushroom, bell pepper, red onion, mozzarella & pizza sauce. Roasted garlic virgin olive oil, mozzarella and goat cheeses, artichoke hearts, sun-dried tomatoes and fresh basil. Spicy Thai Sauce, mozzarella cheese, chicken, bean sprouts, shredded carrots, scallons, peanuts and cilantro. Add a cup of soup to any meal for $2.99, or a side salad for $3.59. All pasta dishes come served with our homemade garlic bread. Andouille sausage, ham, chicken and shrimp simmered in a spicy tomato sauce with peppers, onions and mushrooms. Served on a bed of rice with fresh garlic bread. Classic lamb and beef with English peas, corn and roasted garlic and parsnip mash. Fresh Atlantic cod in our house brewed beer batter. Served with French fries and tarter sauce. Fresh catfish fillet dusted in the brewery's Cajun spices and seared on an iron skillet. Served with seasoned white rice and red spicy jalapeño beans and finished with tangy remoulade. Pulled chicken breast inside flour tortillas and topped with creamy tomatillo sauce and queso fresco. Served with spicy chorizo black beans. Braised and sliced Top Sirloin with mushrooms, roasted cippolini onions and red wine demi glace over papperdelle pasta. Served with ROB garlic bread. Bourbon & honey glazed salmon served on balsamic roasted asparagus and topped with a citrus salad. Fresh tilapia beer battered and fried, topped with a remoulade sauce, pico de gallo and fresh cabbage on a flour tortilla. Served with spicy chorizo beans. Tender breaded pork cutlet served German style with mashed potatoes, gravy and house-made applesauce. House burger with lettuce, tomato, onion, pickle and mayo on toasted bun. With American, Swiss, Pepper Jack or Cheddar cheese, add $1. Burger with lettuce and grilled bacon topped with a fried egg, cheddar and mayo. Two slices of american cheese sandwiched between two quarter pound patties. Served with lettuce, mayo and pickle. Our delicious black bean burger with Pepper Jack cheese, chipotle mayo, lettuce, pickle and onion. Two quarter pound patties with slices of cheese, shredded lettuce, tomato, onion and special sauce. Fontina and white cheddar cheese, thick cut bacon and sliced granny smith apples grilled on fresh sourdough. Poblano braised pork shoulder with salami, ham, swiss and cilantro crème fraiche on a hoagie roll. Hand sliced, slow roasted turkey breast, Swiss cheese, pickles and whole grain aioli on Sourdough bread. Teriyaki chicken breast, grilled pineapple, roasted red pepper, arugula, Fontina cheese and mayo on ciabatta bread. Roasted red pepper, portabella mushroom, zucchini and arugula with chimichurri sauce on focaccia. Grilled chicken breast, avocado, alfalfa sprouts, fresh Mozzarella cheese and chipotle mayo. Chicken breast seasoned with Caribbean Jerk spices, topped with an Ortega chili pepper and Pepper Jack cheese, lettuce and mayo. Breaded chicken breast, housemade marinara, Parmesan and Mozzarella cheeses and fresh basil on focaccia bread. *Can be cooked to order. Consuming raw or undercooked meats, poultry, seafood, shellfish or eggs may increase your risk of foodborne illness.